The Friday File: After a 9% jump to 1.46 billion in 2017, France, for the first time ever, consumed more hamburgers than jambons-beurres, whose sales totaled 1.22 billion. 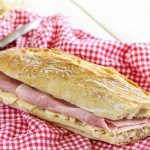 The split baguette with ham and butter had been the best seller since the 19th century! Interestingly, the French also love pizza and consume an average of 22 pounds per person/year, second only to the USA, and double Italian consumption.